The magnificent Chaitya Hall at Karla is the largest and most evolved example of its class. Dating back to the 2nd Century BC, the monuments at Karla are renowned for its ancient Buddhist Rock cut Architecture. Located at a distance of 11 km from Lonavla, just off the Mumbai - Pune Road, these caves are worth spending the weekend at. Situated amidst a range of hills, these were excavated by the Buddhist monks, who used to gather here during the monsoons. Situated in Aurangabad District, it is about 120 km from Mumbai and 40 km from the city of Pune. The two other main hillstations i.e Khandala and Matheran are located near to these caves. Bhaja and Bedsa caves are also very near to Karla. Compared to other caves in Maharashtra like Ajanta and Ellora, these caves are less crowded and good for a pleasant outing. Developed over two periods - from the 2nd century BC to the 2nd century AD, and from the 5th century AD to the 10th century AD, it was started by the Hinayana Buddhists and were later taken over, by the Mahayana sect. The rock cut features at Karla are reached by a steep climb of more than 350-steps. At the entrance, one can see a newly built temple; accompanied by a pillar from the Buddhist period. Dedicated to Goddess Ekveera, it attracts local pilgrims. 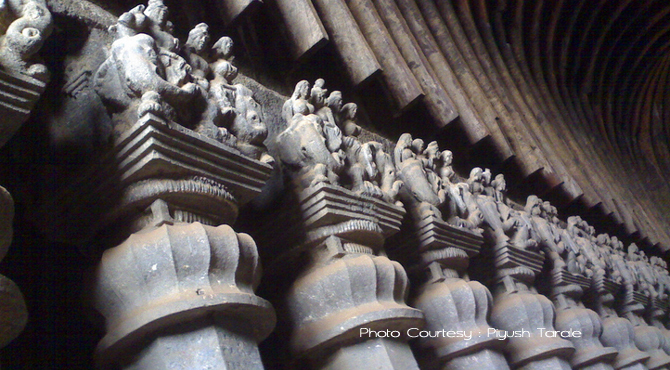 The facade of the caves is formed by carved temple screens, sculptures of males and females, lions and elephants. Outer and inner screens form an antechamber to the main cave. The panels of the wooden doors and windows are finely decorated with intricate sculptures of couples embracing. By the central doorway, one can see sculptures of the Buddha preaching seated on a lion-supported throne, along with magnificent carvings of three elephants. The magnificent Chaitya Hall (prayer hall) measuring 37.87m x 13.87m x 14.02m at Karla is the largest and most evolved example of its class. The facade is dominated by a large horseshoe-shaped window complete with stone imitations. Three important features of the interior of the hall are columns or pillars, the roof vault and the sun windows. The sun windows are arranged in such a way that it filters the light towards the stupa that stands far end of the hall, placed under an umbrella, a symbol of royalty. There are 37 columns in all, of which 30 have interesting capitals showing prosperous men and women riding elephants and horses. The most remarkable feature of this cave are the wooden rafters that support the arched roof and this is the only place in India where 2000 year old wood work can be seen. 10 km from Lonavla is the Lohagad Fort, sited spectacularly at the top of the escarpment. An ideal trekking destination for trekkers, it stands some 3400 ft high. Belongs to 15th century, the fort offers a stunning view of the surrounding sites. Literally means ‘the Iron fort’ it was named after the spiritual leader Lomesh and has a 2000 year old history. The fort established by Chattrapati Shivaji's and was used for keeping prisoners in the year 1564.